So Papertrey Ink is doing contest to win some great products. All you have to do is post your favorite card that you have made. I am new to card making, I started in October. 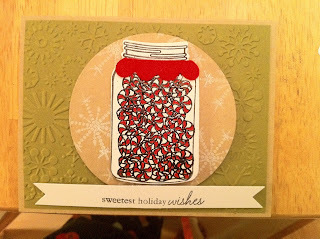 I use Papertrey's blog and team for inspiration and color matching. The more I create I can tell the better I get. My October cards are kind of embarrassing. :) But now when I look through everything I have made it is hard to pick my favorite. But if I had to pick one it would be a Christmas card, of course. I loved all the Christmas stamps. I actually bought too many Christmas stamps from Papertrey during the holidays. I just couldn't help it, I wanted to make everyone Christmas cards to give out. I was actually worried what I would do after Christmas, I was worried I would not be able to make more cards. Thank god for Birthdays and Valentine's Day. Well, I have made more cards this week for people birthdays and just for fun. I hate posting pictures of my cards because right now I just use my iPhone camera. My new Panasonic GF2 is on order, I pray it gets here soon. The Godfather says my pinks look like oranges right now. I need a great camera now.